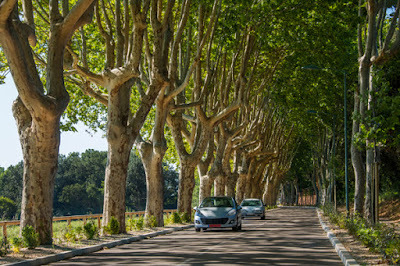 "enjoying the beauty that is France"
Driving along country roads lined and shaded by plane trees is a classic picture of life in many parts of south west France. It is, to some extent, one of the many reasons France is the world’s number one tourism destination. Tragically, these iconic trees are now under threat - from motorists and the road safety lobby. Efforts to remove the trees goes back to the 1970s, when destruction of the trees met a frosty reception by President George Pompidou. Activists are once more up in arms and have launched two petitions demanding a halt to “arbicide” — or tree murder — as they call it. Their campaign carries more weight than it did in 1999 as new research suggests roadside trees can in some cases be used beneficially in cutting down road deaths. Speaking in March this year, Chantal Fauché, president of the Association for the Protection of Roadside Trees, accused “successive French governments of creating an anti-tree psychosis among road users. ‘Trees are actually helpful in warning about bends in the road and keeping speed down. People feel they are driving faster if the trees are rushing past,’ she said”. France is fortunate enough to be the third most forested country in Western Europe with 29% of the country given over to trees. This figure has doubled since 1850. Each year 80 million trees are planted which equates roughly to one tree every 2.5 seconds. At present a group called the European Environment and Social Committee (CESE) is running a petition to save roadside trees across France. Some 400 motorists a year are killed after colliding with tress and the government has ordered that trees within 1.5 metres of roadsides should be removed. So far some 7000 people have signed the petition. But as President George Pompidou said: "France is not made solely to allow the French to drive their cars, and regardless of the importance of road safety, this should not result in the disfiguring of the country’s landscape. Safeguarding the trees planted on roadsides – and I think particularly of the beautiful roads lined with plane trees in the Midi (south) – is essential to the beauty of our country, and for the protection of nature and the human environment. Modern life, increasingly surrounded by concrete, asphalt and neon creates more and more desire and need for people to escape to nature and beauty. The rural roads, (as opposed to motorways designed for speed) must become for the motorist of the late 20th century what the country path is to the walker or horse rider: a route along which one meanders without haste, enjoying the beauty that is France. So let us guard against this systematic destruction of that which is (an important) ingredient of this beauty!"